Plan your beach escape to South Florida and the tropical Fort Lauderdale weather. This 1-BR 1-BA beachfront condo is located on the 12th floor, has stunning panoramic ocean and intracoastal waterway views and is just steps from the popular sandy beaches. This oversize (1000 s.f.) vacation rental home has a S.E. facing balcony that provides the warmth of the sun with direct views of the pool and Atlantic ocean. The unit has a king size bed with first class bedding, flat screen HDTV's in the living room and bedroom and a DVD player. Other amenities include a fold out queen-mattress, a clothes washer/dryer, a fully equipped kitchen with stove, microwave, refrigerator, pots pans, utensils, dishes and a coffee maker; there are plenty of towels, linens and blankets. The Ocean Summit complex is located on the popular Galt Ocean Mile, offering 200 ft. of private beach overlooking the beach and pool with a Bamboo Beach Tike Bar next door. 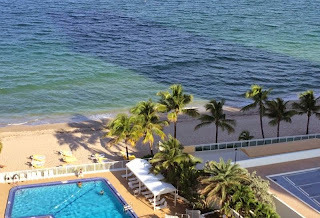 Come enjoy coastal living in the warm South Florida weather at this oceanfront Fort Lauderdale condo.